Our troops have really been on my mind this week. Losing 30 highly trained, dedicated soldiers in that Afghan attack last week was tough. Just think: thirty coffins, thirty graves, thirty grieving families, thirty people missing at the Thanksgiving Day table this fall. It's truly a terrible loss. That's why I'm glad Which Wich, a chain of 200 "which" restaurants (wish we had one in Boston! ), did something nice this week for the troops. You might remember Which Wich as I included their promotion in my examples of Independence Day cause marketing. They got top honors and I promised to include their campaign in the next edition of my book, Cause Marketing for Dummies, which was just released but will have a second edition with new content. The decorated bags they collected were filled with messages, kind words and treats. You can actually check out the decorated bags here. I hope these flagged bags will cheer up the troops. They could sorely use it after the past week. Happy Fourth of July! I'm celebrating the day with these three cause marketing promotions that support our troops - a great cause to support on the day we celebrate freedom. I didn't find these promotions. I asked you to send me your examples of Indendence Day cause marketing and you responded! These three were the best. In first place, Joey Leslie in San Luis Obiscpo, California sent me this promotion from Which Wich Superior Sandwiches. Which Wich will be filling the decorated bags with treats for troops overseas. This is a great example of cause marketing and shows that ANY company can find a creative way to support a cause. Congrats to Joey Leslie and Which Wich! Joey will be receiving a copy of my new book Cause Marketing for Dummies. Which Wich will be featured in the second edition of Cause Marketing for Dummies in the chapter Top 10 Cause Marketing Promotions We Wish We Could Take Credit For. In second place, Colleen Cronin of South Boston who's a huge fan of Great American Cookies, shared this promotion with me. When you buy the "Uncle Sam Hat" or "US Flag", GAC will donate $2 to the Yellow Ribbon Fund, a nonprofit committed to helping injured troops and their families. This promotion kicks off TODAY and runs through September 16th! This program is a model example of a purchase-triggered cause marketing program. 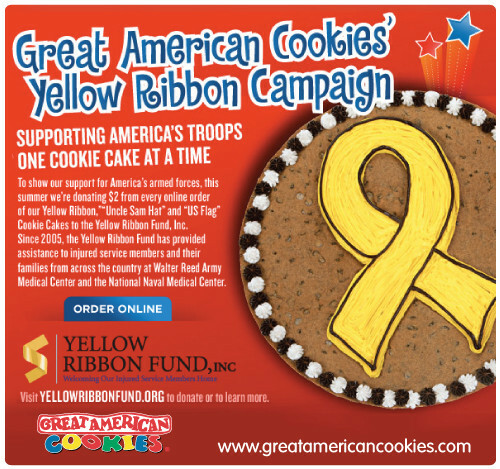 A cookie purchase triggers a $2 donation to the Yellow Ribbon Fund. While Great American Cookies, not the consumer, ultimately makes the donation, the company hopes the program will make cookie sales rise, which in turn increases the donation to the fund. It's a win for the company, for the cause and for consumers. In third place is Chris Mann, a cause marketer at Boston's Cone Communications. who pointed me to a client promotion involving Budweiser and Folds of Honor Foundation. FHF supports the families of fallen soldiers with scholarships and other kinds of assistance. 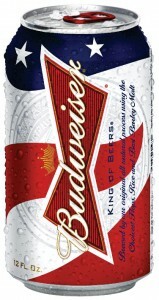 Budweiser cans will display the flag this summer, and for every case sold, Budweiser will donate five cents to Folds of Honor. This ain't no tin can promotion. Budweiser's goal is to raise $2 million for Folds of Honor. Congrats to Joey, Colleen and Chris for great submissions!